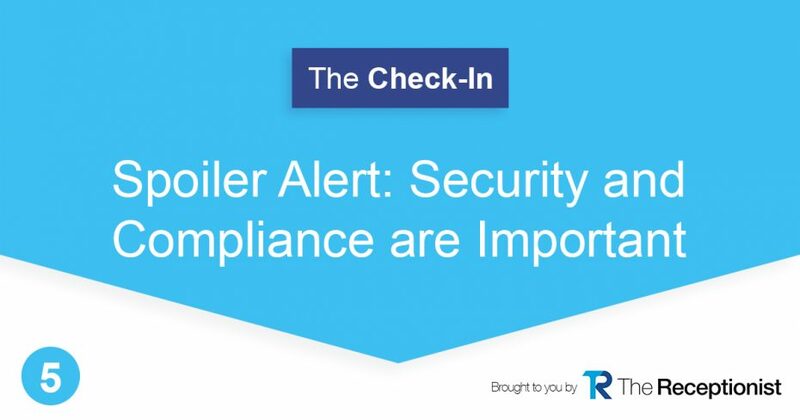 When it comes to adopting new technology, especially when you’re handling personal information, you need to make sure you’re following security and compliance guidelines within your industry. Even if you don’t have specific rules you must follow, you want to make sure that the information you’re gathering from people is secure. Michael Ashford, Director of Marketing at The Receptionist talks about this important topic. People can be sensitive about sharing personal information, so you want to make sure that when you collect data or information from someone, that you’re protecting it and treating it with care. Individuals will be more willing to share their information when they know that it’s secure. As a business, you don’t want to find yourself in a position where the information you’ve been entrusted with is not protected. Trust us- your customers won’t be happy. And, if you don’t have systems in place to protect the information of those coming into your office, you run the risk of that information falling into the wrong hands (or going missing) which is bad for business! The Receptionist can help alleviate concerns about unsecured data and information, helps to securely maintain records over time, and creates a professional way to check someone in when they visit your office. Some industries have VERY specific rules and regulations that must be followed in order to maintain their licenses or continue their ability to do business with certain companies. We’re proud that The Receptionist can help with this too. Whether you need to have accurate, real-time records about who is in your facility, badges with photos and notes about levels of security, or need to show required safety videos to visitors before they enter the building, The Receptionist has been developed with safety and security best practices in mind. Even if your business does not have these specific rules and regulations you’re required to follow, you can still use these features within your company- everyone who purchases The Receptionist has access. We want you, your customers, visitors, and those you do business with to know that they are working with a company that takes security and compliance seriously and we hope that The Receptionist can help you do that.